My body is dissolving in your separation & my soul is breaking into pieces. Ya Rasulullah! Due to my sins, My heart is weak and becoming enticed. Ya Rasulullah! Dillam Paz Murda Aawara, Ze Isyaa. Ya Rasul Allah! I must sacrifice my soul on your blessed sandal. Ya Rasulullah! Fida-E-Naqsh-E-Nalainat, Kunam Ja. Ya Rasul Allah! And the chain of your love binds my heart. Yet I don’t say that I know this language (of love). Ya Rasulullah! Nu’mi Goyam Ke Mun Bustum, Sukun Daa. Ya Rasul Allah! And I feel that my sins have blackened my heart. Ya Rasulullah! Pashemaanam, Pashemaanam, Pashemaanam. Ya Rasul Allah! Then do not deprive Jaami of your (Ya Rasul Allah) exalted intercession. Makun Mahruume Jaami Raa, Daraa Aan. Ya Rasul Allah! 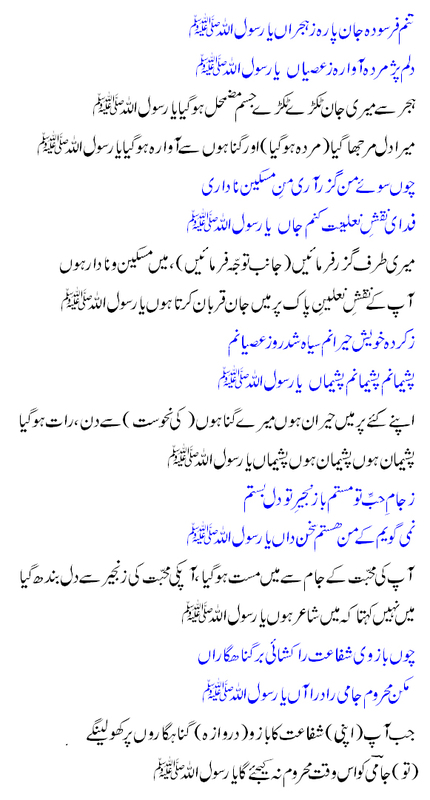 Very emotional lyrics and contain humility jami is a great lover and ashiq of hazrat Muhammad. Hazrat owais qarni “R.A” aur Sarkar-a-Jami ka ishaq Hazrat muhammad a mustafa (P.B.U.H) sy akhari darjay pay tha. kash sarkar sy aisa ishaq hamain b naseeb ho jay .-aameeen. ye puri qaienaat sohne aqaa da noor chamk raha he. please translate this complete kalam in roman urdu. I also request your good self to make this translation a Pdf file.